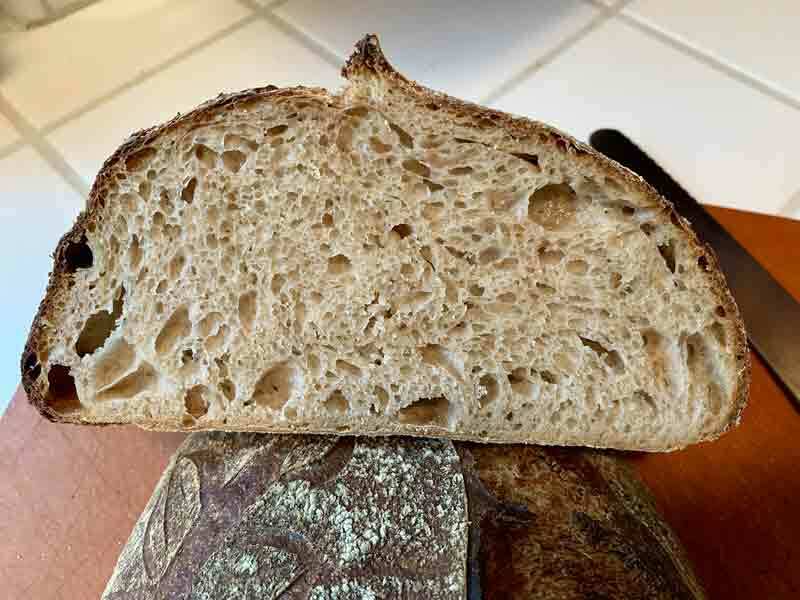 For this week's bakes, I am returning to my variations on Ken Forkish's “Field Blend #2.” The flour mix used is the same as that of several previous bakes, except that the Whole Wheat flour used is “Warthog” hard red Winter wheat. One of the bakers I follow on Instagram swears by this variety, so I though I would try it. What I found right away was that it seems a lot less thirsty than any of the other hard red Winter wheats I have used to date. So I did reduce the hydration slightly and still ended up with a much slacker dough than expected. I made two loaves with this dough. One was retarded for about 20 hours. The other loaf was retarded for about 44 hours. Dissolve the starter in the water, add the flours and mix thoroughly. Place in a clean bowl and cover tightly. Ferment at 80ºF until doubled in volume. 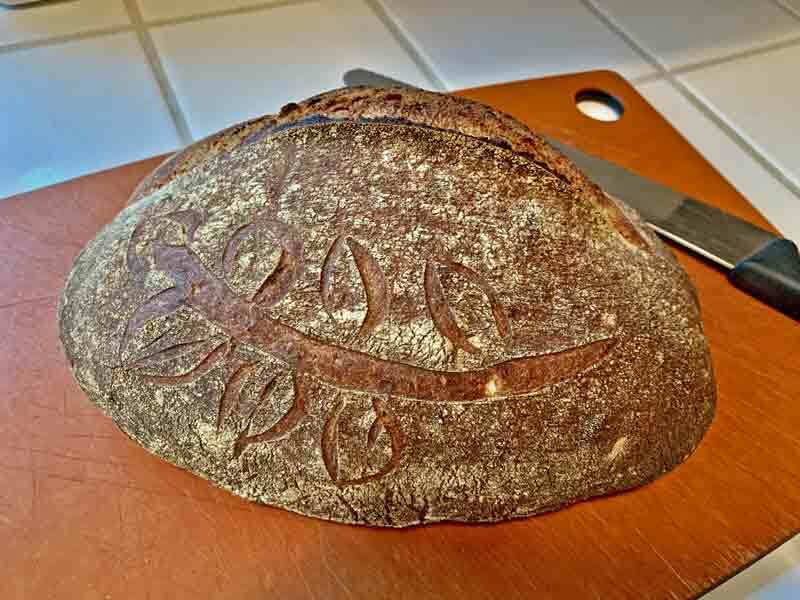 The levain can be used immediately or refrigerated for up to 3 days. If refrigerated, I take it out 2 hours before I am going to incorporate it into the final dough. In general, this means I take it out when I am ready to mix the autolyse. In a large bowl, mix the water and the flours to a shaggy mass. Be sure to leave no dry flour in the bowl. Cover and let sit at room temperature for 1-2 hours (autolyse). Sprinkle the salt over the dough and add the levain in 4-6 portions. Mix in with a spatula, spoon or your wet hands. Transfer the dough to a clean, lightly oiled bowl and cover it. Ferment at 80ºF for 3-4 hours. Stretch and fold in the bowl at 30 and 60 minutes. Stretch and fold on a lightly floured board 50 and 100 minutes later. Note: I bulk ferment this dough in a Brød and Taylor Proofing Box. If you are fermenting at a cooler temperature, it will just take longer. Do additional stretch and folds hourly to redistribute metabolites and equalize dough temperature. Leave the dough alone for the last hour. The dough should increase in volume to about double and be pillowy. Divide the dough into two equal pieces. Pre-shape as rounds and cover with a dish towel. Let it rest for 10-30 minutes. Shape as boules or bâtards and place in floured bannetons. Place in food-safe plastic bags (or cover with a damp tea towel). Allow to proof at room temperature for 30-60 minutes, then refrigerate for 8-16 hours. Remove from refrigerator and let sit at room temperature for 1-2 hours, depending on degree of proofing. 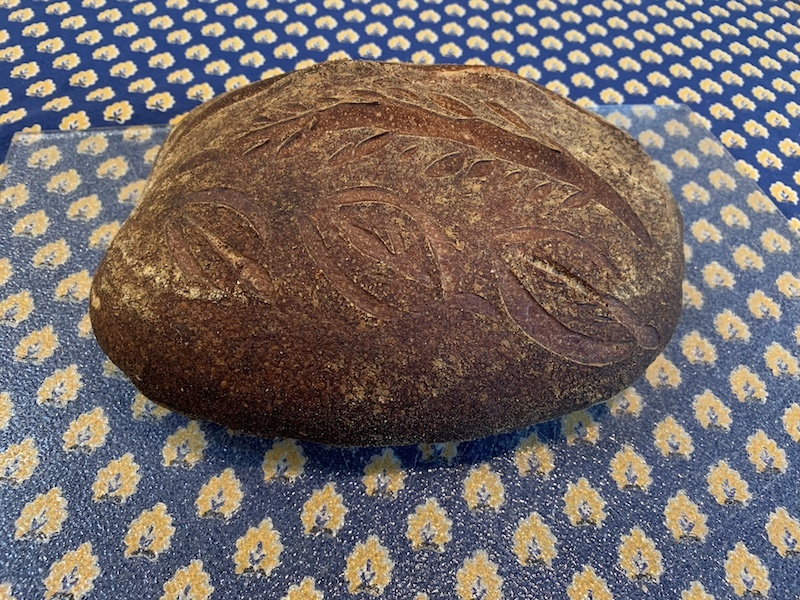 If baking on a stone turn down the oven temperature to 460ºF, transfer loaves to a peel, steam the oven, score the loaves as desired and load them onto the stone. Remove the steaming apparatus after 15 minutes. Continue baking for another 30-40 minutes. If you have a convection oven, set it to 435ºF Convection Bake for the last part of the bake. The loaves are done when they are darkly colored, sound hollow when the bottoms are thumped and have an internal temperature of 205ºF. If baking in DO's, transfer the loaves into the DO bottoms. Score the loaves as desired. Using good hot pads or oven gloves, remove the DO tops from the oven and cover the bottoms. Transfer the DO's to the oven. After 30 minutes, remove the DO covers. Continue to bake the loaves for another 20 minutes. Remove the loaves from the oven and place them on a cooling rack. Cool completely before slicing. Note: These times and temperatures assume 900-1200 g loaves. If using this dough for smaller loaves, use higher temperatures and shorter bake times. If baking larger loaves, use lower temperatures and longer bake times. The loaf that had been retarded for 20 hours was tasted after completely cooling. The crust was crunchy. The crumb was tender. The flavor was complex, sweet and moderately sour. A very delicious bread. The loaf that was retarded for an additional day seemed a bit over-proofed. It had a weaker gluten sheath and spread more when transferred to the peel. It had less oven spring and less bloom. The crust did brown well though. 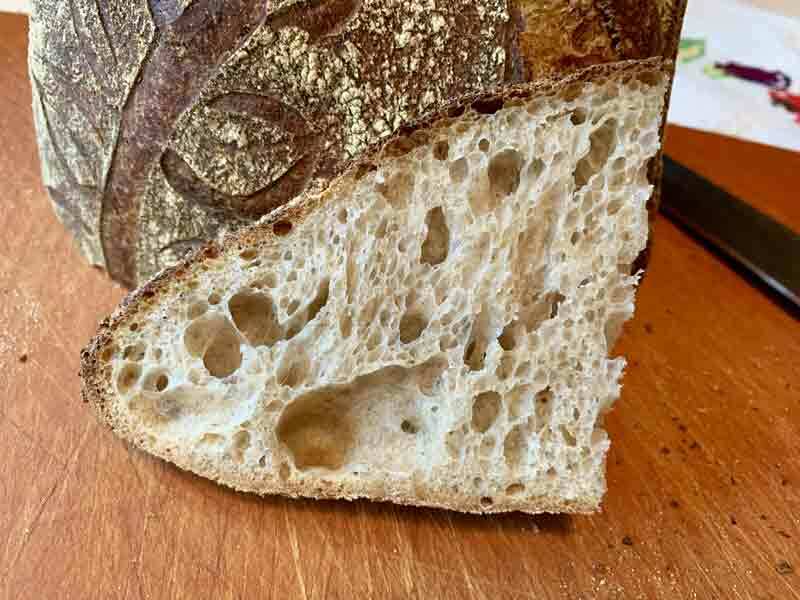 The texture of the crust and crumb were the same as the first loaf. The flavor was somewhat more sour but also less complex to my taste when first tasted. The next morning, as usual, the flavors had melded and improved. Now, I would not conclude that a 40+ hour cold retardation is a bad idea in general. For this particular bread, it did not provide an improved result. Not bad bread, but the first loaf was better, at least to my palate. 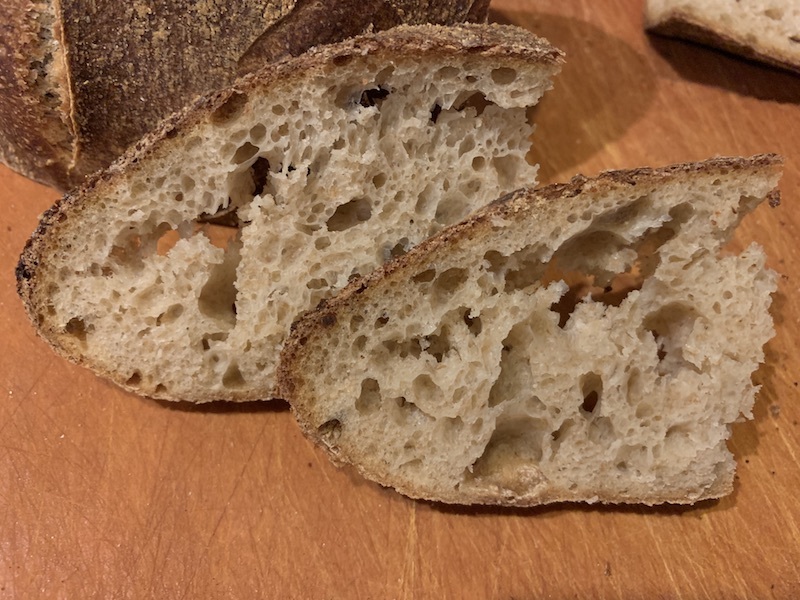 5% less whole grain and using all AP for the rest made for a better crumb in both cases I think and being more slack is also the result and expected to some degree. Love these experiments David. Happy baking ! Another Attempt to Produce a San Francisco-Style Sourdough Bread: Finally, success!